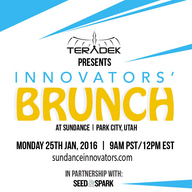 Teradek presents the Innovators' Brunch live from the Sundance Film Festival in Park City, Utah. Monday, January 25th 9:30am PST / 12:30pm EST. 2- Will VR Kill Film?